Serums have become an accepted part of any great skin care routine. That’s because the best serums, regardless of your skin type, will provide potent concentrated ingredients to protect skin from environmental damage and signs of aging, along with weightless but maximum hydration. All this in a uniquely soothing lightweight formula that can be worn under any moisturizer or layered with your other treatment products. Serums can even be used on their own, which can work great for oily skin. In numerous ways, serums can be the answer to many skin care needs. A Serum So Light, You Won’t Even Know It’s There! The difference between serums for combination to oily skin and serums for other skin types is the ultra-light formula, still with an amazing amount of deeply hydrating ingredients. Along with the most potent antioxidants and skin-restoring ingredients, these serums feel almost like water when applied on skin. Our serums for combination to oily skin easily absorb into skin and provide all those benefits with a beautifully silky feel, leaving a restored appearance that lasts throughout the day. 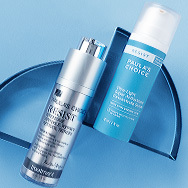 RESIST Ultra-Light Super Antioxidant Concentrate Serum has a water-light texture with a broad range of antioxidants and skin-restoring ingredients, including niacinamide and grape-derived resveratrol, that provide many benefits for combination to oily skin. SKIN BALANCING Super Antioxidant Concentrate Serum has a soft, light feel that supplies skin with potent antioxidants and retinol to visibly improve the appearance of wrinkles and uneven skin tone. RESIST Intensive Wrinkle-Repair Retinol Serum contains stabilized retinol along with vitamin-derived antioxidants to diminish pore size and improve signs of aging, including a visible lack of firmness. You can add any of these serums to your routine and use them morning and evening to help balance combination to oily skin while supplying the vital anti-aging ingredients that even oily skin needs to look younger and feel healthier.